VAM dB provides insurance commission tracking for all types of insurance and different ways you may get paid from carriers. 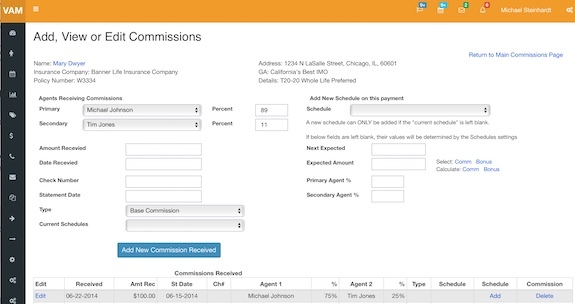 Commissions are tracked by each individual check that comes into your office, plus bonuses and overrides you receive. You can track split cases and generate reports by agent showing what has been received and when. 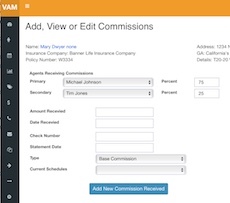 Commission schedules can be created to enter ahead of time all payments expected to be received including renewals. VAM dB has production reports and both projected and past due reports to help you get an overview of your commissions. The projected report helps you to know what will be coming in the upcoming months, combined with policies outstanding, good estimates can be made to plan future business activity for your office. The past due report helps you stay on top of any check you haven't received so you can follow up on it right away. Checks can get lost in the mail or misplaced in an office. With VAM dB you won't have to worry about getting the money you already earned! The commission module can be customized completely like the rest of the database to meet the way you handle commissions in your office. Generating any needed reports for the office, agents, lead sources, insurance companies etc. Track each commission check for all policies. Reports by company, agent, lead source and more. Past due and projected reports help you manage commissions and make sure you never miss a check.